Serenity and splashes of Rose Quartz. Hello. Hope your Hump Day was fantastic. First off, the few of you who commented on my post from yesterday and those who e-mailed me, thank you. I always appreciate your thoughts, advise and prayers - always know that. Well, it is after 1.00 AM and I am now just typing this post, but I am sure logging hours into a laptop past midnight is normal and happens more often than we'd like if you are a blogger, right? #BloggerLife #BloggerProblems #BusyMom #MomLife. I am not one to follow stupid rules like "No White After Labor Day" however I had not worn my White Skinny Jeans since last May or last June. I love these Zara Jeans with ankle zippers, so much. They even made it into quite a few of my Favorite Outfits from 2015 so far. And I have been inspired by several of you who have worn your own white skinny jeans lately, so why not. Heck, I even went for a White Blouse. And I topped it off with this Oversized Cable-Knit Hooded Cardigan from Abercrombie which happens to be in Baby Blue or Serenity one of the two IT colors of 2016. For good measure and since I wore this Outfit to work (the hat was only for outdoors) the week before Valentine's Day I punched it with some pops of Rose Quartz (a.k.a. Blush) via my accessories. My Glittery Pumps, Watch, Beaded Pearl Bracelets and Statement Necklace all have Rose Quartz in them. Inspired by Valentine's Day, I carried a Graffiti Bag by Kenneth Cole. From far it looks like the word Love is written throughout the bag. I also wore little Sterling Silver Infinity Studs courtesy of Gems, Gals and Gifts Boutique. I love how this monochromatic yet colorful outfit turned out and how all the different stones and geometric shapes of all the stones of my jewelry worked together. I shopped my closet for almost all of the pieces. As a matter of fact most of these pieces are over 5 years old (cardigan, hat, shoes, blouse and bag). It goes to show you that several very CURRENT trends like big cozy cardigans, the colors of the moment and pointed shoes are hiding in your closet, already. Are you wearing any Serenity and Rose Quartz this Winter? How do you wear them? Blush/Rose Quartz Glittery Pointy Pumps: Payless (similar, open-toe style, Splurge, love these), (similar w/ platform heels, Steal). 2 Baby Pink Stretchy Bracelets w/ Mini Faux Pearl Beads: Forever 21. Red+White Faux Snakeskin Watch w/ multifaceted Bronze Glass Face: A Local Boutique in Albania (similar, Steal), (similar, Splurge). Gold Tone Statement Necklace w/ Sparkly Rectangle Stones in different Jewel Tones: A Boutique in Albania (similar, Splurge), (similar, Great Deal, love this). Red+Black Graffiti Red Bag: Kenneth Cole Reaction (similar, Splurge), (similar, Steal, love this). Sterling Silver "Infinity" Stud Earrings: c/o Gems, Gals & Gifts (New) (similar in gold, Splurge), (similar pave set, Steal, love these). White Chiffon, V-neck, Ruffle-Front, Shirt-Sleeve Blouse: The Limited (similar, Steal), (similar, Steal). Baby Blue/Serenity, Long, Over-Sized, Hooded Cardigan: Abercrombie (similar, Splurge), (similar, Steal, love this). White Skinny Jeans w/ back Gold Zipper on the hem: Zara (similar, Splurge), (similar, Steal). Light Olive Green Tweed Fedora: Old (similar, Splurge), (similar, Steal). And the Ladies of "Thirsday Fashion Files" (with whom I am linking up today) totally surprised me. Carrie featured my Valentine Collaboration Look on her blog today, while Jill is doing a similar outfit today (she looks so elegant) with her own White Skinny Jeans and an Off-White Turtleneck Sweater. Whitney and The Wardrobe Stylist. 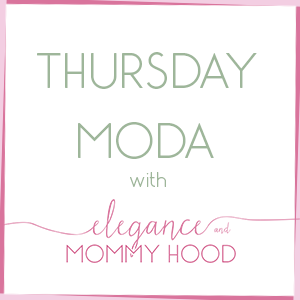 I am also linking up with Bri's Monthly linkup "Thursday Threads". The Linkup theme this week is "Blushing Beauty".